Fat Tuesday actually came early for the staff at FBC yesterday. Traditionally it is on Fat Tuesday that we burn the previous years fronds from Palm Sunday. We store them in the garage and pull them out and light them in the parking lot. The ash is then used in the Ash Wednesday service the next evening. For more on Ash Wednesday and Lent and why we observe it at FBC, click here. 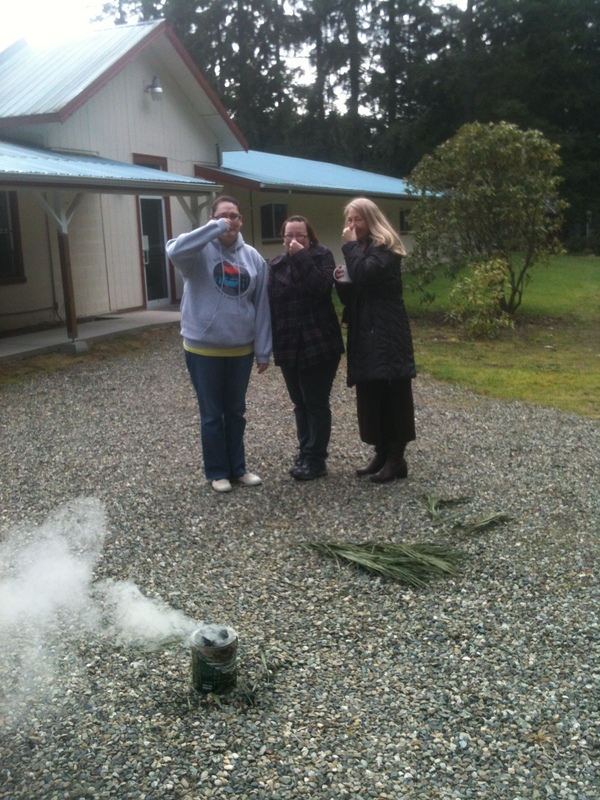 But this year we did it a day early because we all were here at the office anyway so Pastor Kendall, Tiffany, and the amazing Bonnie and I crammed them and burned them. You don’t see me in the photo, because I am taking the picture. You will notice that all three of them are holding their noses. That is because they (they being the burning fronds not the three of them) really, really, really stink and the odor is pungent and stays with you all day long. I had to air out my coat last night. The way we do it is we take a metal coffee can and smash as many of them down into it as possible and then light them on fire. Then we smash more of them into the fire. It takes about 25-30 minutes because the fronds almost always have been coated with some kind of fire retardant when we purchase them so they don’t want to burn easily, but once they do, once it catches and gets hot–look out! Last year one of our pastors burned off his eyebrows and mustache. One year I tried to bake them in the oven to get a harder char and a firmer ash, but that didn’t work too well. Those things stink enough, but when you bake them they smell like another kind of green grass that people turn to smoke. After the fronds burn down, we let it set for two or three hours to cool down and then the can is safe enough to handle and the ash can be put into bowls or “plated” for the Wednesday night service. My other tradition on Fat Tuesday is to eat tacos. Tonight I will make my wonderful Mrs. Greenbean and the sprouts delicious tacos, guacamole, refried beans, lazy enchiladas, served with chips and lots of iced tea. Then the next day we begin our Lenten fast. We decided last night what we would fast this year. I am not telling you, because it is our family’s vow and if we share it, then, well, we lose something (Matthew 6:16-18) of the spiritual vitality that goes with fasting.